Timberwolves' Andrew Wiggins keeps cool, ignores social-media "poison"
Criticized much of the season on Twitter and elsewhere for his inner flame burning too low, Wolves young star Andrew Wiggins' cool now maybe is serving him well with the heat turned up in the playoffs. Wiggins has been the Wolves' most consistent player in this best-of-seven series with Houston so far and he said at Monday's shoot before Game 4 that he hasn't -- and won't -- pay attention to the words of those who want more from a guy who last fall signed a max contracts that begins next season. "I don't really go on social media too much," Wiggins said. "I just watch movies, play video games and play with my dog. That's it. Everything else I don't see. We're not worried about what the outside world thinks. We're just focused on us. Feeding into all that stuff is poison. You don't want that to get to you. Just stay focused and stay with what you have to do." 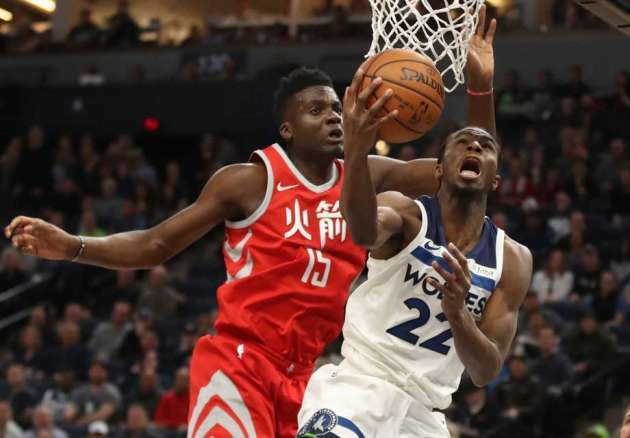 The Wolves drew within 2-1 in the seriers with Saturday's 121-105 victory and Jimmy Butler was asked this morning if he expects a "big punch" from the Rockets tonight after they lost Saturday. "I would hope so," Butler said. "I mean, this is playoff basketball. I don't think they're going to lay down and just us win. But we'll be OK. Put our guards up, throw some punches as well." When asked if he would have made some management changes had the Wolves not beaten Denver in overtime in the season finale and reached the playoffs, Taylor paused and said, "We made the playoffs, that will be my answer. Thank goodness we made the playoffs." He also said the Wolves can afford to pay Butler, Wiggins and Karl-Anthony Towns max contracts, but said they'd also have to attract veteran free agents willing to sign contracts below market value for the chance to win big and play alongside those three stars. He suggested Butler and coach Tom Thibodeau would have to do their part in the recruiting. The league's best teams -- Golden State, Houston, etc. -- are able to do that. He also said it'd help if the Wolves could get an impact rookie like Utah did with Donovan Mitchell on a cost-efficient rookie contract.